They were arresting him after he was accused of beating a woman. CLEARWATER – Three police officers were injured late Saturday (Nov. 11) while they were arresting him, the Clearwater Police Department said. The three officers, who were stabbed or cut with a knife, were treated at a local hospital for minor injuries and released. Justin Alexander Shuford, 36, of Port Richey, was charged with one count of attempted homicide, two counts of aggravated battery on a law enforcement officer, and one count each of resisting arrest with violence and domestic battery. Police said they were called to the Marina parking lot at 37 Causeway Blvd. about 10:47 p.m. for a report that a man was beating a woman. When they arrived, they said Shuford was being aggressive toward citizens who came to the woman’s aid. 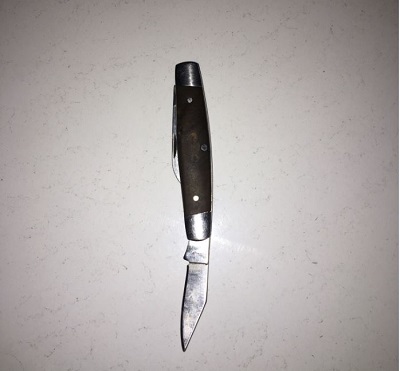 Officer tried to take Shuford into custody but he tried to resist being handcuffed and stabbed or cut three officers with a small knife he had concealed. Photos courtesy of the Clearwater police.